Babies between the ages of 4 and 6 months can start to eat solid foods, although breast milk or formula should still the supply the majority of calories at this age. Many experts suggest starting with cereal as the first infant food, but fruits and vegetables are good choices, as long as you follow simple guidelines on introducing solid foods. A 5-month-old can, in most cases, eat apple puree without added sugar. However, follow your doctor's recommendations on starting solid foods. Babies need certain physical abilities before they can eat solid foods. A baby gains the ability to move foods in his mouth and swallow them when he's approximately 5 months old. A baby of this age normally can sit up well enough in a high chair to eat solid foods. Changes in the lining of the intestine occur between 4 and 7 months that decrease the risk of allergic reactions, according to author and pediatrician William Sears, M.D. A baby starting solid food may prefer moist foods, making apple puree an acceptable choice. Start with a very small amount of solid food; a 5-month-old may have difficulty figuring out what to do with this next texture at first. If you make your own apple puree, add extra water at first and then thicken the consistency as your baby gets older and learns to chew. Experts recommend introducing new foods to your baby one at a time and waiting two to three days before introducing new foods. If you do this, it's easier to tell which food causes a reaction if your baby has allergy symptoms after eating new foods. In the United States, around two percent of the population has an apple allergy, according to data from the 1999 Internet Symposium on Food Allergens. Apples can cause a reaction known as oral allergy syndrome, with itching, swelling, or irritation of the mouth, throat, lips and gums. Babies with this reaction to apples often have an allergy to birch trees as well. Cooked apples may not cause the same reaction as raw. Babies do not need added sugar. 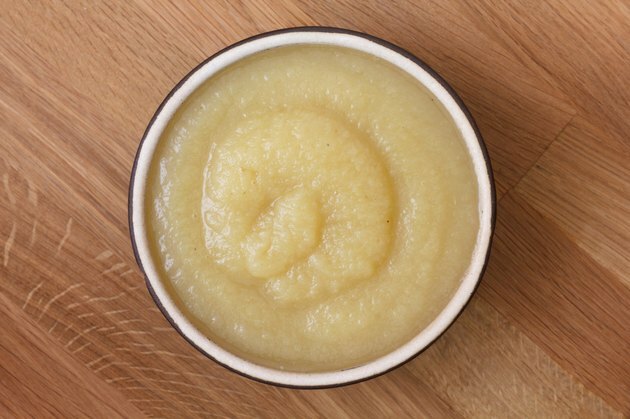 If you make your own apple puree, it's easy to control the ingredients. If you buy commercially prepared baby foods or purees, read the ingredients list carefully. Because fruit tastes sweet, some doctors recommend starting with vegetables or cereals as a first food to keep your baby from preferring sweet tastes. Ask Dr. Sears; 6 Reasons to Delay Introducing Solid Food; William Sears, M.D.